Black Friday, the unofficial kick-off of the holiday shopping season, has become as much of a tradition to some deal-hungry US consumers as Thanksgiving itself, spawning other sale-heavy "holidays" such as Cyber Monday and Lazy Sunday. Black Friday, the unofficial kick-off of the holiday shopping season, has become as much of a tradition to some deal-hungry US consumers as Thanksgiving itself, spawning other sale-heavy “holidays” such as Cyber Monday and Lazy Sunday. But American Express is helping to make Small Business Saturday, which raises awareness of local shops, an even more worthwhile shopping event. The credit card company deserves praise for continuing to build on the widespread appeal of Small Business Saturday, when consumers are encouraged to avoid big-box retailers. AmEx debuted the initiative in 2010. American Express has also put its money where its mouth is. The company gave 100,000 card members a $25 credit for shopping locally, totaling about $2.5 million in total discounts. About 500,000 small businesses around the country participated in the event. AmEx also saturated both the TV airwaves and top social media platforms with ads. The strategy worked. US consumers who were aware of the effort spent $5.5 billion with independent merchants. More than 3.2 million Facebook users liked the initiative's Facebook page and upwards of 213,000 supportive tweets were sent in November, according to the National Federation of Independent Businesses. But even more impressive was the political and organizational support that American Express marshaled to boost the initiative. 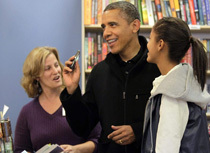 President Barack Obama took his daughters shopping at a small bookstore in the Virginia suburbs to mark the day. Other political leaders such as New York City Mayor Michael Bloomberg supported it – making it a rare issue that garners across-the-board bipartisan political support. AmEx has a winning initiative in Small Business Saturday, but that doesn't mean it can rest on its laurels if it wants to make the event an annual success. The company will have to keep its discounts compelling enough to make consumers ignore the convenience of e-commerce sites or the selection of major retailers – and it will need to continue to reach both young and old consumers through TV and social media marketing.